What if the power to heal was all around you in the natural world? Since the dawn of humanity, people from across the globe have used what was in “nature’s pharmacy” to heal themselves — botanical treatments, healing tinctures and medicinal remedies from the herbs, flowers and flora that surrounded them. While the advances of modern medicine are miraculous, as we’ve pursued the newest frontiers of science, we’ve too often lost touch with our biological and spiritual connection to nature… and the healing power that comes through our plant allies. This is why I’m passionate about inviting you to join me for The Plant Medicine Summit, where you’ll discover how plants can purify, rejuvenate and evolve us, as well as sharpen our minds, extend our lives and deepen our connection with this blessed planet. This special gathering will feature 25+ leading ecological experts, health practitioners and inspiring educators — including people like David Crow, Dr. Vasant Lad, Dr. Jill Stansbury, David Winston, Sara Crow, Lakisha Jenkins, Matthew Wood, KP Khalsa, Acharya Shunya and others. They’re sharing with you practices and insights for working with medicinal herbs, flowers, mushrooms, aromatic ceremonial plants and essential oils to revitalize your health, your community and our planet. I hope you’ll participate in this special online gathering presented by The Shift Network. The Plant Medicine Summit will benefit anyone who is intrigued by the healing and evolutionary benefits of botanical medicine as well as professionals across multiple disciplines who work with herbs, plants, oils, energetics or the environment. Whether you’re experimenting with herbal gardening, supplementing your diet, seeking to treat a disease, or looking for tips on working with clients, you’ll find eye-opening sessions that will inspire, educate and empower you. Join a vibrant global community and an amazing panel of presenters to discover the curative and evolutionary powers of medicinal plants — many of which you can grow in your own garden or pick up in your neighborhood! 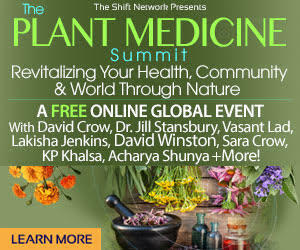 The Plant Medicine Summit was wonderfully informative, valuable and interesting. Each speaker was amazingly knowledgeable, credible and gave volumes of valuable, important, relevant information on their subject. I learned so much from each one. This is an amazing group of very knowledgeable and interesting presenters. I found that even though I have been an herbalist for over 40 years that I learned something from each and every one of these individuals. Blessings to all. I am an experienced plant person and herbal practitioner, yet in every conversation there was some new twist, insight or nuisance than sparked my curiosity to go even deeper into plant magic and connect the dots to that which I have learned. David Crow was a fantastic interviewer–he really knows how to pull the good stuff out of the presenters! I really enjoyed listening. It was fabulous to hear the well thought out questions posed, and the educated and experienced but accessible solutions, concerning some serious issues associated with aging.